Gay theatre pioneer, and a dearly beloved friend of mine, Doric Wilson passed away in his sleep on the evening of May 7, 2011. Also at the Cino in 1961 his Now She Dances! was the first American play to deal positively with gay people, a founding moment in the gay theatre movement. He was one of the first playwrights invited to join the Barr/Wilder/Albee Playwright’s Unit and later became a founding member of Circle Repertory Company. Doric was also a notable gay activist. He participated in the Stonewall riots (an experience commemorated in his 1982 masterpiece Street Theater), and was active in the Gay Activist Alliance, an early gay liberation organization. In 2004, Doric was one of the Grand Marshals of the 35th Anniversary New York City Pride Day Parade. He is featured in the documentary film, “Stonewall Uprising” (2010), recently aired on PBS. In 1974, Doric (with Billy Blackwell, Peter del Valle and John McSpadden) formed TOSOS (The Other Side of Silence), the first professional theatre company to deal openly and honestly with the gay experience. In June 2001, Wilson, and directors Mark Finley and Barry Childs resurrected the company as TOSOS II (of which I am a member). The return of TOSOS has been met with critical acclaim and awards and has achieved a well-earned reputation for the talent and professionalism of its company. Doric was one of a kind, a great spirit, and will be sorely, sorely missed. 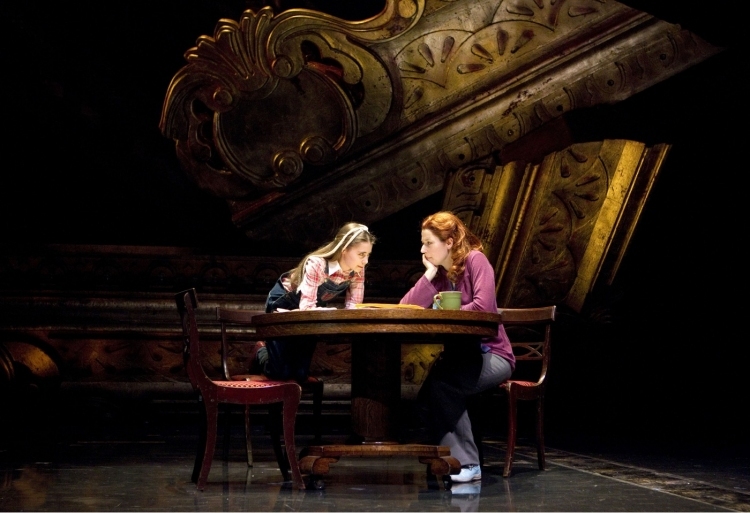 The People in the Picture is not the strongest way to end the Broadway season. I certainly didn’t hate it or have a horrible time, but I think that the way it’s executed doesn’t tell this particular story particularly well. In it, former star of the Polish Yiddish theater Raisel (Donna Murphy) recounts her story to her appreciative granddaughter. If book and lyric writer Iris Dart (author of the novel Beaches) had kept her focus on Raisel’s life in the theater, this would have been a much more interesting evening. Instead, she creates something of a soap opera out of her descent into dementia, and a melodrama out of her relationship with her daughter, and neither of these subplots feel genuine or moving. While there is a compelling reason to tell the history of the Polish Yiddish Theatre, we get only the most generalized wash of that here. Also, of course the story of the Holocaust needs to be told as fully as it can, but it is given the sketchiest outline here. The show is at its best when it looks steadily either at antisemitism or Jewish art-making, and weakest when it shifts away from them. The two strongest justifications for telling this story get short shrift, while its most mundane aspects hog the music and the stage time. That music, by rock and roll legend Mike Stoller and his protege Artie Butler, is mostly terrific, if not as pungent as their best work. Murphy gives an impassioned, committed and skillful performance as Raisel, switching ages and decades with effortless ease. She is given strong support by a terrific cast – Lewis J. Stadlen is particularly good as deadpan comedian Avram Krinsky – so it’s just unfortunate that this often tuneful musical on a worthy subject never quite gels. Garson Kanin’s comedy Born Yesterday makes some political statements that seem punchier than I had expected. This timeless – or rather still-timely – show tells the story of shady, brutish businessman Harry Brock (Jim Belushi) out to work Washington for everything it has to offer, and his dumb blonde girlfriend Billie Dawn (major discovery Nina Arianda). Turns out she’s not so dumb, making more trouble than Brock ever bargained for. 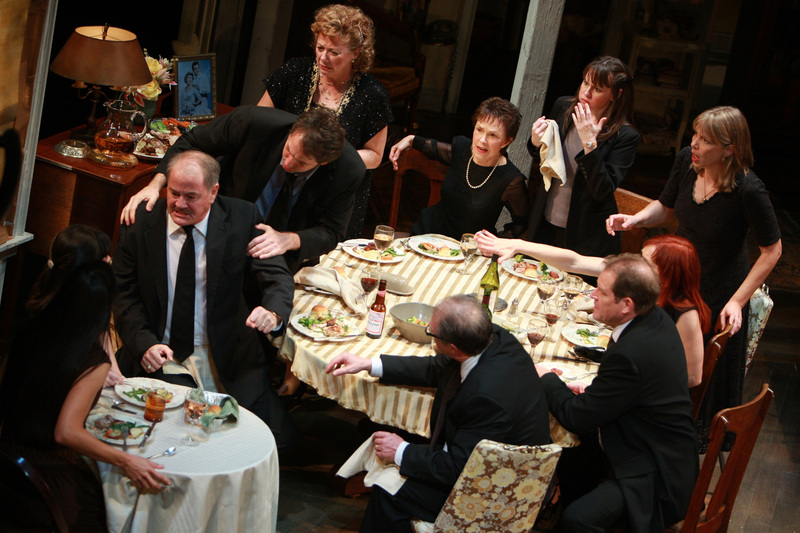 Unfortunately, the corruption in American politics that Kanin is out to skewer in the play is still very alive, and so the the play still has plenty of satiric bite in addition to its more straightforward comic pleasures. I’ll add my voice to the critical chorus: Arianda’s take on Dawn is brilliant, totally honoring what Judy Holliday famously did with the role in the film, while adding squawky Ozone Park realness that sounds like it could be coming directly from Cyndi Lauper, and a gleefulness that is all her own. Jim Belushi is an ideal Brock, giving both his thuggishness and childlike vulnerability full play. Robert Sean Leonard plays Paul Verrall, the reporter who shepherds Billie’s intellectual awakening. He plays Verrall as a shy, bemused milquetoast – exactly what he appears to be on the page. It’s a valid, if decidedly literal, take on the role, just not a very exciting one, and not one that can stand up to Arianda and Belushi’s larger than life performances. The brooding that William Holden brought to the role in the film might play a bit corny on a 2011 stage, but Verrall needs his own kind of aggressiveness to really register, and Leonard doesn’t bring that. Frank Woods is marvelous as Ed Devery, Brock’s lawyer. There is some sense that he’s still playing Roy Cohn, whom he portrayed so well in last fall’s Angels in America – but that’s not a bad thing, it’s actually a really fascinating choice that brings colorful grit and groundedness to what could be a minor comic role. Doug Hughes has done a first-rate job of casting this fine revival, and has done this wonderful, smart comedy a great service. It’s the feel-good hit of the season! Sister Act‘s only real competition in that department is Priscilla Queen of the Desert. Sister Act has even less on its mind than the frothy Priscilla – and where pure fun and entertainment is concerned, that isn’t necessarily a bad thing. 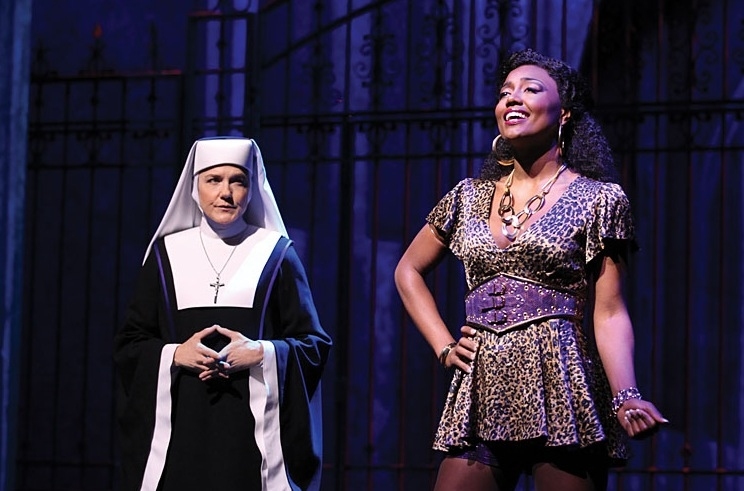 Indeed, this tale of disco diva Deloris Van Cartier (Patina Miller) put in protective custody disguised as a nun in a convent is solidly crafted, willfully un-serious musical comedy entertainment. It apparently wasn’t always so: In its incarnation on London’s West End, everybody loved the show’s score and star Miller, but were unconvinced by the book. For its Broadway edition, the producers have hired an old musical comedy hand, director Jerry Zaks, who in turned called in Xanadu bookwriter Douglas Carter Beane to punch up Sister Act‘s dialogue. Whatever Zaks and Beane did, it worked: Sister Act zooms along with nary a dull moment (not even in the reflective second-act ballads, no small feat). Not deep or incisive, but why should it be? While the structure of the show is traditional musical comedy, the score by composer Alan Menken and lyricist Glenn Slater successfully evokes Philly soul, funk and disco – all flavors that taste really good to me. Patina Miller is marvelously energetic, wryly funny and has one of those delicious big belting r&b voices. The supporting company of nuns is terrific, with Audrie Neenan standing out as Sister Mary Lazarus. Legendary screen character actress Mary Wickes played Mary Lazarus, and Neenan honors everything Wickes brought to the part and gamely adds a very individual sparkle. Neenan breaks out in a hilarious rap at one point. It is indicative of the detail that Mencken brought to scoring the show that her rap is very clearly from the early Sugarhill Records school of party rap – the only kind of hip-hop that would have gained any national attention by 1978, when the musical is set. While no-one on the creative team takes the story or show too seriously, Menken, Zaks and Beane take their craft seriously, and that makes all the difference.